Al Schopp, Vice President of Antero Resources, provided a detailed description of the oil and gas resources located in Barbour County during the October luncheon meeting at the Medallion Restaurant of the Barbour County Chamber of Commerce. 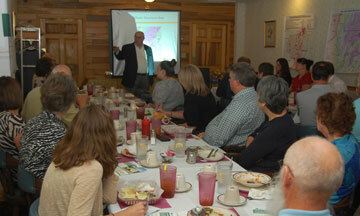 The well-attended session included local employers and several members from county and federal government. The meeting was chaired by Chamber President Reg Trefethen, Manager of the county development authority. Although Antero does not have business properties in Barbour County, Schopp took the time to research and report the information about the mining of the Marcellus shale deposits located under the county. Having spent over $ 8 billion in Ohio and West Virginia in the last 5 years, Schopp reported investing about $ 55 million with vendors and royalty owners in Barbour, which county produced 1 % of Antero’s gas during 2017. Barbour, he said, is the 11th largest gas producer in the state. Schopp said that Antero provided about $ 150,000 in severance taxes to Barbour County during the past fiscal year, and about $ 1 million in property taxes. The problem, he said, is that because of Barbour’s location in the Marcellus deposits, it is in a “dry gas” area, and because of its potentially more complex structure, the gas is more difficult to mine and is of lower energy content, which makes it less desirable to Antero than the “wet gas” in neighboring counties. Schopp reported that the number of wells in Barbour declined from 9 wells in 2014 to one new well drilled in 2016 and no new wells started last year. There are currently 37 active Marcellus gas wells in the county. All are maintained by companies other than Antero, he said. Schopp described the process and the cost of drilling and maintaining gas wells. Although by-products such as oil and natural gas liquid are sold, the cost of obtaining gas includes purchasing property right-of-way, exploration, pad installation, drilling - sometimes up to 5 miles in length - steel pipes, road construction, waste-water disposal, and follow-up production and maintenance. The current lack of infrastructure in Barbour is also a potential problem for operators, he said. Antero spends $ 11 billion in firm transportation alone, he said. Schopp concluded by discussing the 30-year plan for Antero’s acreage, and stated that natural gas should never be cheaper anywhere in the United States outside the Appalachian basin since the Marcellus supply is the 2nd largest in the world. Barbour needs pricing at the $ 3.50 to $ 4.00 range before it is economically viable to compete with the “wet gas” areas, he said. The local current index was as low as $ 1.20 this week. Future technology and market conditions may improve Barbour’s position in the market, he said.